It all started from a revelation. 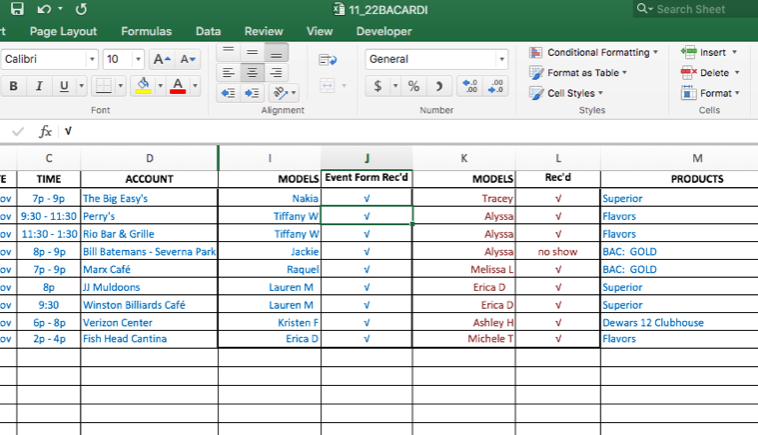 Countless hours wasted...just gone...with duplicate and triplicate entry of event data into a spreadsheet and Quickbooks, and bleary-eyed exhaustion. Too many late nights, too many times retraining staff, too much, well...EVERYTHING. Too many bars with teh same name... you want to know the sales for the QUARTER of a single SKU???? How do we keep track of that? It used to literally take three days, full time, to get payroll ready for delivery every other week. 24 actual hours of work. TIME IS THE ONLY NON-RENEWABLE RESOURCE. And a ton of time was being spent... on repetitive tasks - that could be...should be...automated. Didn't you start your business so you could spend your day stressing about what was falling through the cracks? Don't you love wasting time looking up the same information over and over again? Oh. Right. Of COURSE you don't. That's where STiLETTO will save the day. With our world becoming more and more connected, it makes sense that you have clients who would want to know what's happening at an event...as it's happening. 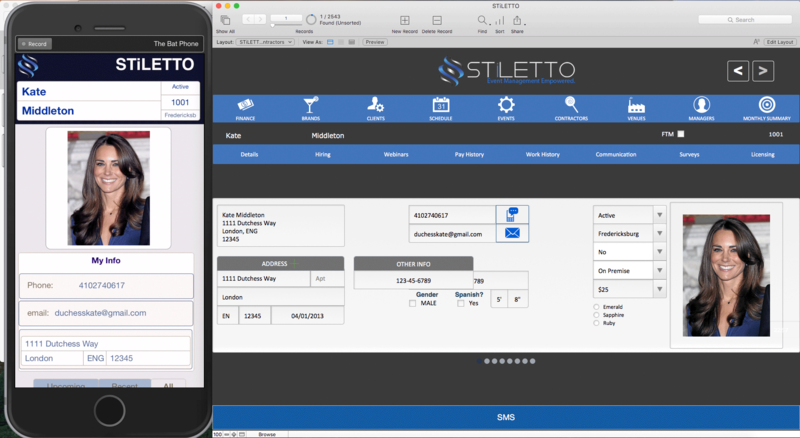 With the STiLETTO iOS app, your staff will be able to check in at the venue, collect photos and bottle sales, upload receipts and venue staff sign-off, and you'll be able to rest easy knowing your i's were dotted and your t's were crossed. An event marketing agency is all about its people. 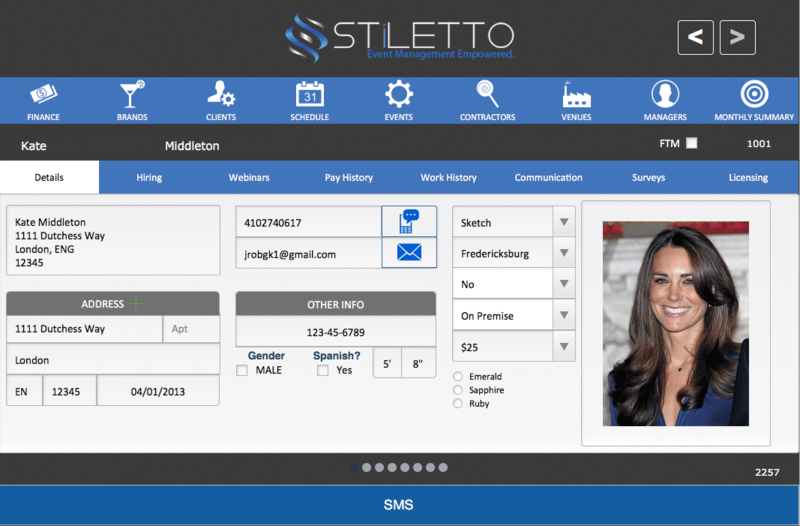 STiLETTO manages those people with a tracking system designed to keep you up-to-date on the qualities and nuances of performance and event execution. It generates the numbers. Who is the top seller of spirits in your organization? We've got that. Of Wine? We've got that, too, (and it's probably not the same person). 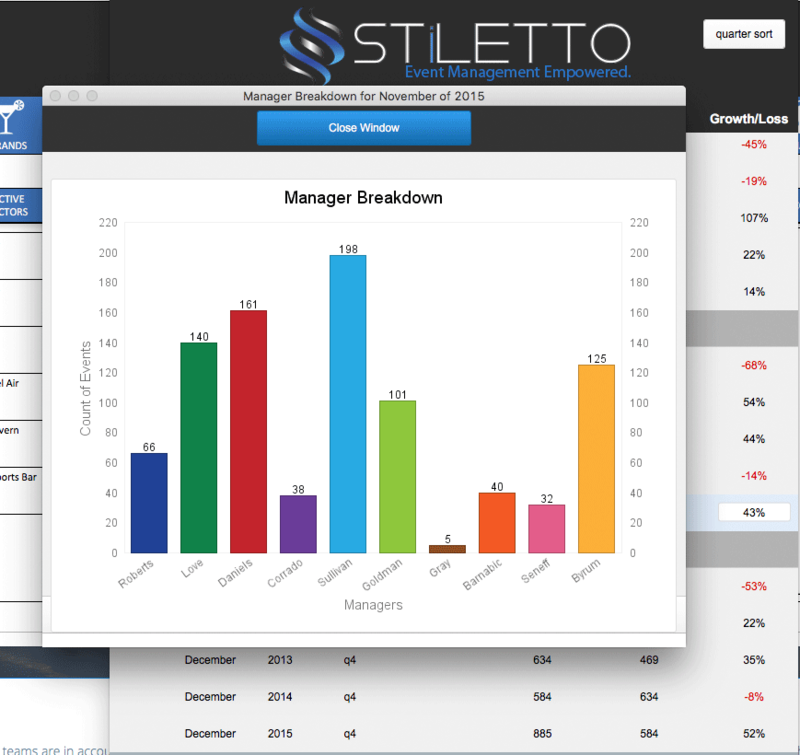 STiLETTO quantifies your personnel's performance - and makes the difficult task of managing people a breeze. All successful businesses have a finger on the pulse of where they stand in relation to each month, year, and quarter. If you don't know what to expect with your busy seasons, you'll never know how to plan for the down times. 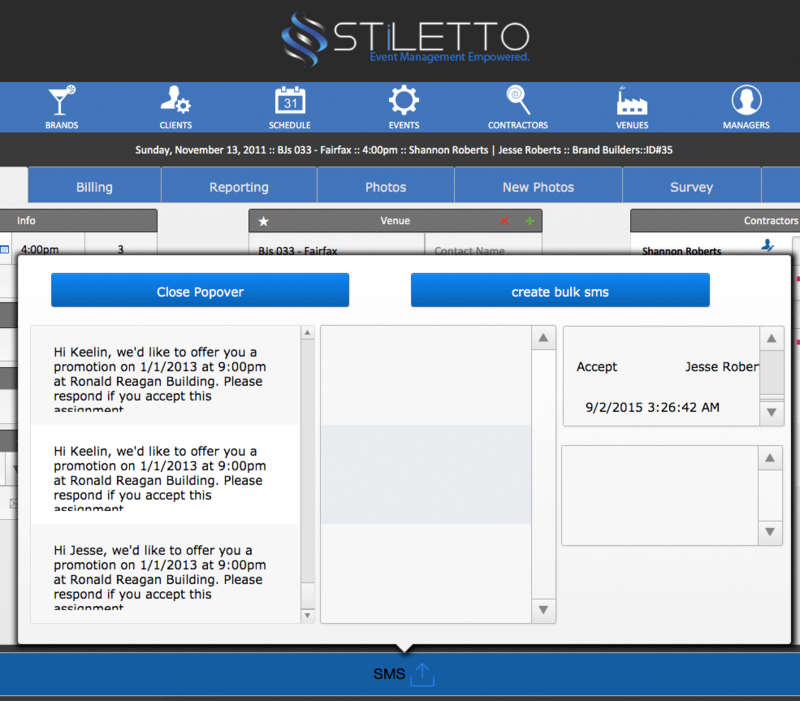 STiLETTO's reporting function generates insightful reporting to manage your present and predict your future.